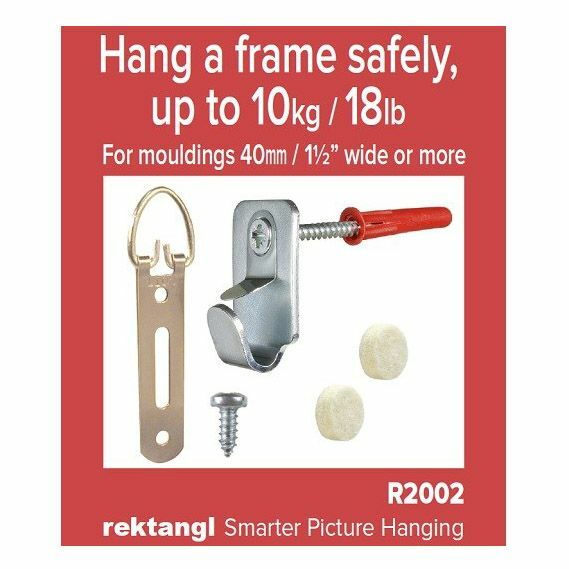 Safety Hook Hanging Pack - 10kg. Packs include everything you need to hang one frame up to 10kg in weight. Pack contains: Heavy Duty safety hook x 2 Screws and wall plugs x 2 Hanger, adjustable, with screws x 2 Spacer pads Important: Any load figures are given for guidance only. Users should ascertain that the hangers are suitable for the frame and wall material. Important: Any load figures are given for guidance only. Users should ascertain that the hangers are suitable for the frame and wall material.